If you’re looking at some watches for sale, consider treating yourself or a loved one to a wooden watch. Wooden watches have become a top choice for those who are passionate about nature-inspired products and love everything natural. But the thing is, some wooden watches can tend to be clunky, low quality, and unsophisticated. So I painstakingly went through all of the wooden watches that are out there. In the end, I hand-picked and reviewed a list of the 10 the best wood watches. These 10 wood watches bring together style, class, and tremendous quality. When you pair one of these beauties with the right outfit, your friends and colleagues will be absolutely envious. Expect lots of comments. More so than you would with a thousand dollar designer watch! That being said, let’s take a ride into the world of wooden watches, and help you find the perfect fit for your needs. Wooden watches are a one-of-a-kind accessory that you can wear for years to come. I especially love them because they’re the perfect way to spice up boring work attire. And despite most of them being hand-crafted, they are significantly cheaper than most watches out there. No more racking up your credit card debt just to look stylish. Finally, environmental enthusiasts have an accessory for them. When you wear a wooden watch, you combine the characteristics of a beautiful, durable, and environmentally friendly accessory. 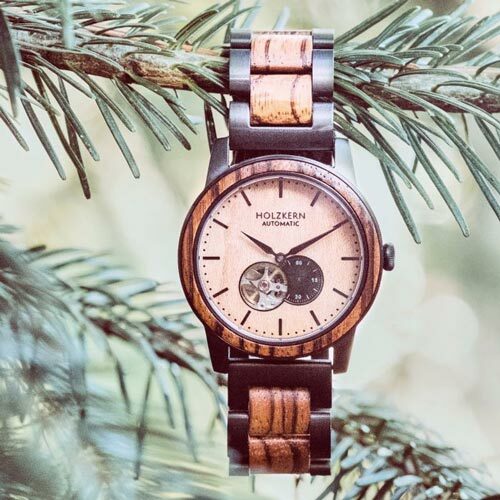 You’re probably wondering how wooden watches help the environment, right? Watches made from materials such as bamboo come from sustainable forests, where every tree that is cut down is replaced by a new one that is planted. But not all wood watches are made of bamboo, which is a fast-growing sustainable resource. So if the environment is a concern for you, stick to the bamboo watches mentioned here. Skin Sensitive to Metals? No Problem. Some people are allergic to the metals used in standard watches. It usually causes itchy or painful rashes. Most wood watches don’t use any metals that could trigger an allergic reaction. This makes wood watches the perfect fit for those who have skin that’s sensitive to metals. Say goodbye to scorching hot metal watches in the summer. Unlike metal watches, wooden watches don’t retain heat. Plus, they are more comfortable to wear, and much lighter. That being said, let’s explore some of the best wooden watches that are out there for both men–click here if you’re looking for women’s watches. 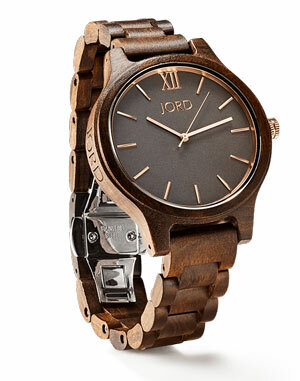 JORD is well known for producing high-quality luxury wood watches. While they may have a slightly bigger price tag, the quality of these watches is out of this world. What sets Jord apart from other brands is that they get their wood from sustainable sources. A great majority of the wood for their watches comes from furniture remnants. Small pieces are recovered to contribute to watch links and cases that would otherwise end up in the waste cycle. But they don’t let their dedication to the environment compromise the quality of their product. Their watches are built well and look fantastic. Plus, they have a wide range of options to suit your budget. If you’re not a fan of a certain aspect, their website lest you customize the wood type for the faces. When you order, you must provide your wrist size. If you’re not spot on with your measurements, it’s difficult to remove links from the band yourself which means you’ll have to bring it to a jewler. Their logo is engraved on the sidie of the watch as seen in the image. I wasn’t a huge fan of that since the logo is already on the face. Most wooden watch enthusiasts are well aware of this gem. In fact, this Bewell watch is one of the single most popular wooden watches on the market. And for good reason. Each Bewell watch is beautifully handcrafted from 100% natural wood materials. It’s also lightweight, comfortable and elegant despite its rustic design. It’s beautiful. I mean come on… look at it! Want to stand out from the crowd? This walnut and ebony watch from Treehut will help you do just that. When I wear this watch, I always manage to get at least a few compliments, which is way more than I ever get with standard watches. That’s when you know it’s a nice watch 😉 . In addition to the brown wooden face and straps, the quartz display also lies against a dark brown backdrop that emphasizes nature to its core. Who thought that a brown on brown look would look this good? This wooden watch by Holzkern is hands-down one of the most beautifully crated watches I’ve ever laid my eyes on. It’s handmade in Austria and offers an elegant, yet rustic look that will surely turn some heads. The face is constructed of maple wood whereas the border and wristband are made from zebrawood. The quality of this watch is unmatched by any other. Holzkern kindly sent me this watch so I could see it in person and give my honest opinion on it. The band contains metal (stainless steel) so if your skin doesn’t like it, this watch isn’t for you. The Treehut men’s bamboo watch features an eco-elegant design that emphasizes environmental consciousness. The face of the watch features a minimalist design, with an analog layout that strikes a balance between earthy and classy. 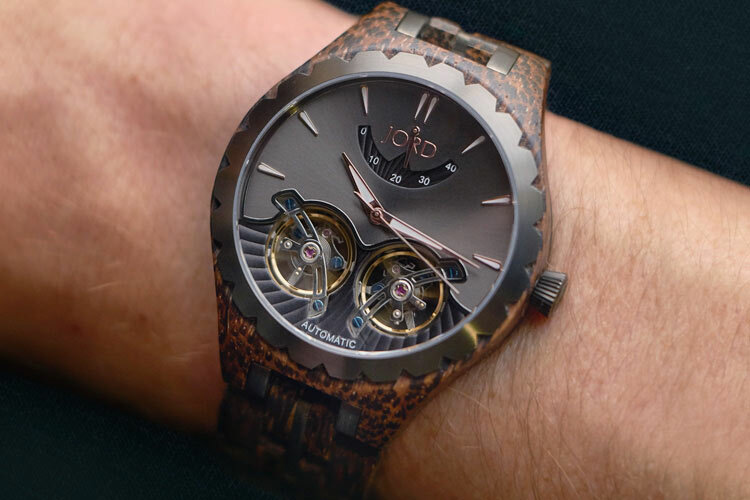 What makes this watch even better is that Treehut doesn’t fall short in the quality department. It has a 3 ATM water resistance, and the bamboo face adds an extra layer of heat resistance as well. An affordably priced and eco-friendly solution, the LeeEV wooden watch is a stylish handcrafted zebra sandal watch that incorporates a vintage design. It’s a truly timeless look, emphasizing nature and sophistication. Unlike some other wood watches, the face is white making it easily visible in all lighting. Nature meets style and elegance with the JORD Cora Series wooden watch for women. Although it has a higher price tag, this is THE wood watch to own. It features 100% natural and sustainably sourced zebrawood, which gets finer and more attractive over time–like a fine wine. The hands and band are made of genuine rose gold. The face is exceptionally durable since it’s made from sapphire glass (crystal). If you’re looking to make a statement, this is the watch to get. Comes with a box and maintenance kit to keep it looking amazing as it ages. Higher price, but the quality makes up for it. Want to combine the elegance of a traditional watch with a subtle earthy vibe? The Bioston Fashion Casual wooden watch is a great option for you. It’s a handmade natural wooden watch, featuring materials that are specially designed for people with sensitive skin and allergies. The watch is made of eco-friendly and natural zebra. This is the perfect watch for those who think there’s too much wood on most wooden watches. This watch is another perfect fit for those who like wood watches but still want them to look modern and sleek. Viable Harvest does a fantastic job with achieving a minimalistic, yet elegant design with this watch. It features Japanese quartz movement, so it stays on time consistently. You can get a variant of this watch (it’s just bigger) for men. If you like things that are more floral or artsy, this watch may be the right one for you. While it may not be as elegant as some of the other watches I mentioned here, it has an eye-catching design that’s truly unique to any other watch. It’s also 100% hypo-allergenic, meaning people with metal or chemical sensitivities will have no problem wearing this watch. Even the paints used are free of toxic chemicals. And to top it off, the face is made of scratch-proof mineral glass. Women are certainly not left behind in the wooden watch fashion trend. The CUCOL wooden bamboo watch comes with a stylish and authentic bamboo case, and a face that features a slender, circular design. There’s also no distracting emblem on the surface. Some brands will make their logo obnoxiously big on the watch’s face. And this clearly is not the case with CUCOL. This watch captures the essence of minimalism, but still manages to be eye-catching at the same time. You can easily mix and match the CUCOL watch with many different accessories thanks to its neutral colors. Thanks, I enjoyed my time reading these reviews.